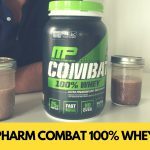 Home » MusclePharm Combat 100% Whey Review — Cheap But Still Good? MusclePharm is a Colorado-based supplement company that’s beloved by many for their popular line of protein bars, Combat Crunch. (The “Combat” moniker is because they sponsor a lot of MMA athletes.) But they’re also heavy hitters in the bodybuilding world and they have a female-focused brand called Fit Miss. I wanted to try their protein powder, Combat 100% Whey, to see if they’ve got what it takes. 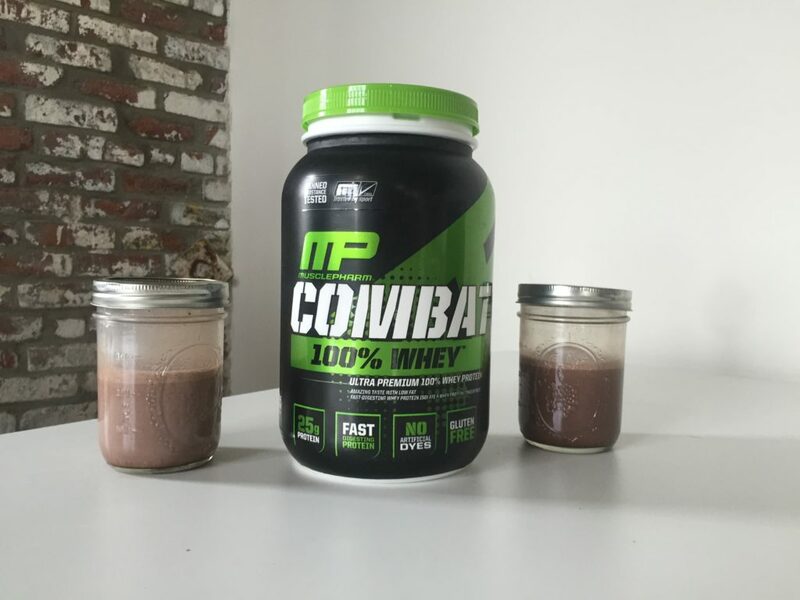 One scoop of Combat Whey contains 130 calories, 25 grams of protein, 3 grams of carbohydrates (1 gram of fiber) and 1.5 grams of fat. A scoop also contains 70 milligrams of sodium (that’s 3 percent of your recommended daily intake), 10 percent of your daily calcium, and 6 percent of your daily iron. There aren’t any extra vitamins or minerals added to it. 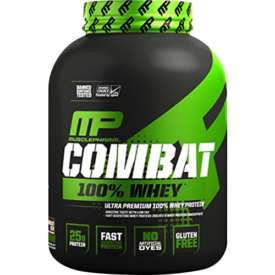 This is a blend of whey isolate and whey concentrate, which are the first two ingredients. Isolate has the most protein per calorie, while concentrate contains more fat and carbs. Then there’s cocoa powder, “natural and artificial flavors,” cellulose gum, guar gum, xanthan gum, sucralose (also known as Splenda), acesulfame potassium, and soy lecithin. An excellent option if you're looking for low carb, low sodium whey that won't break the bank. The most notable ingredients here are the soy lecithin (it helps mixability, but masomey athletes eschew soy) and the artificial sweetener acesulfame potassium (it’s widely recognized as safe, but frowned upon by some). The scientific consensus is that neither of these ingredients are harmful, but if you have some dietary restrictions (self-imposed or otherwise), you might take issue with them. 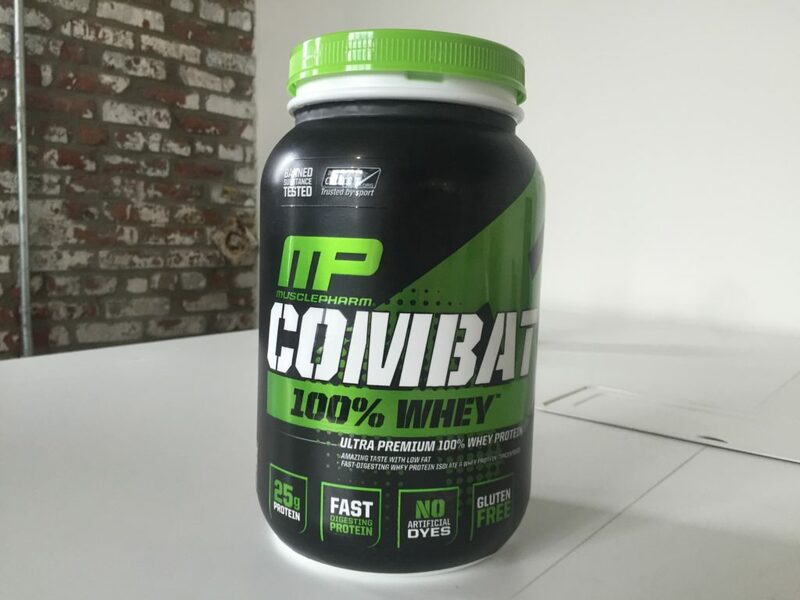 There are a few unusual things about Combat Whey, like the three kinds of thickening gums and the very low price, but what stood out the most was the lack of digestive enzymes. That might sound a little strange, but most whey protein powders that contain whey concentrate also come with digestive enzymes like lactase and aminogen. This is because whey concentrate contains lactose, and so does MusclePharm Combat Whey. Most whey isolates are lactose free and don’t include the enzymes, but Combat Whey has the lactose and no enzymes, so if you have difficulty with lactose or even if you don’t and you have a history of difficulty digesting protein powder, you should probably avoid this one. Otherwise, it’s a pretty solid product. It’s got a good macro split and it’s low in calories. 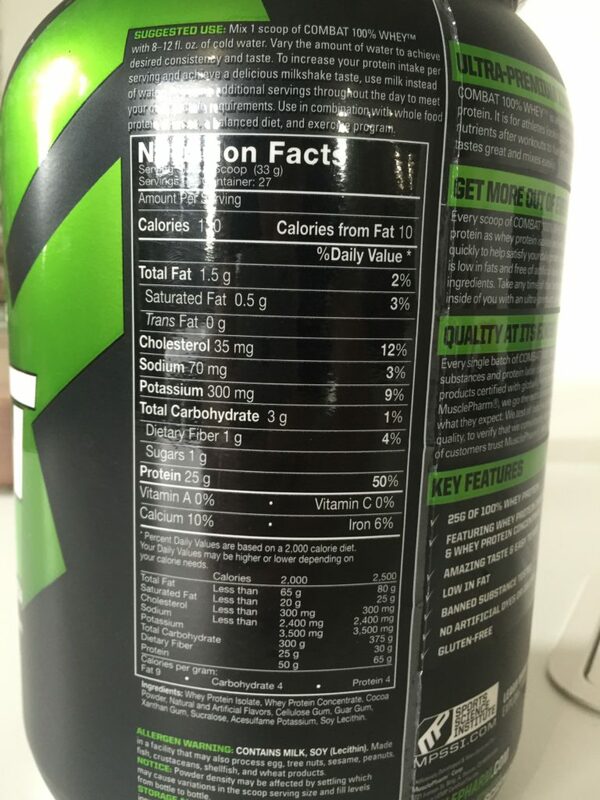 But if you’d rather not consume a product with soy, artificial sweeteners, or lactose — or if you don’t like the fact that one of the entries on the ingredients label just says “natural and artificial flavors” without getting any more specific — you may want to steer clear of Combat Whey. A 2-pound tub will cost about $26 for 27 servings, so 96 cents per serving or 3.84 cents per gram of protein. If you’d rather save some cash and get a 5-pound tub, you’ll pay around $43 for 73 servings, which is 55 cents a serving or 2.2 cents per gram of protein. That’s really cheap. When they come in 5-pound tubs, most popular whey protein powders are between 3 and 4 cents per gram of protein. Compare it with Jym (4.49 cents per gram, 4-pound tub), Isopure Zero Carb (3.82 cents per gram, 3-pound tub), BPI Sports’ Whey-HD (3.6 cents per gram, 5-pound tub), Cellucor Cor-Performance Whey (3.57 cents per gram, 5-pound tub), and Optimum Nutrition’s Gold Standard Whey is 3.31 cents per gram of protein for a 5-pound tub. Since it contains soy lecithin, I was surprised to find that this didn’t mix that well. It mixed fine, but after shaking it in a mason jar there were still some granules in the drink and a fair amount of product settled to the bottom of the jar after a few minutes. I tried Chocolate Milk flavor, and I was pleased to find that it had a rich, malty flavor. Funnily enough, Chocolate Milk flavor wasn’t that milky — it had more of a dark chocolate flavor, so while it tasted awesome with milk, it tasted quite watery when mixed with water. That might sound obvious, but there are some whey powders (like Ghost or Syntha-6) that taste just like chocolate milk even when mixed with water. Despite all the artificial ingredients, Combat Whey isn’t one of them. If you have any concerns about soy, lactose, artificial ingredients, acesulfame potassium, or sucralose, or if you can’t consume something created in a facility that processes eggs, tree nuts, sesame, peanuts, fish, crustaceans, shellfish, and wheat products, or if you want to know absolutely everything that goes into a product (MusclePharm doesn’t go into more detail than “natural and artificial flavors”), then Combat 100% Whey won’t fit your bill. There’s also an argument to be made that if it doesn’t contain digestive enzymes, you may not absorb quite as much protein as you would if it did contain them. But if you have good gut health and no concerns about allergens and artificial ingredients, this seems like a good, inexpensive bet. do they want us to have to spend more for separate sups?